Today I have swatches of the lovely new OPI Designer Series lacquers. These two polishes are "granite-inspired", featuring "a matte textured finish with mineral-like reflections". They look a lot like some of the texture polishes we've seen lately, but they actually feel quite different. They are much smoother than other textures. To me they feel closer to medium-sized glitter with a matte top coat. You know that frosted glass feeling you get when you mattify a glitter? That's what both of these felt like to me. Both were extremely easy to apply and opaque in two coats. Dry time was fairly fast for both as well. This lovely sapphire blue is OPI DS Lapis, and I think it is my favorite of the two. 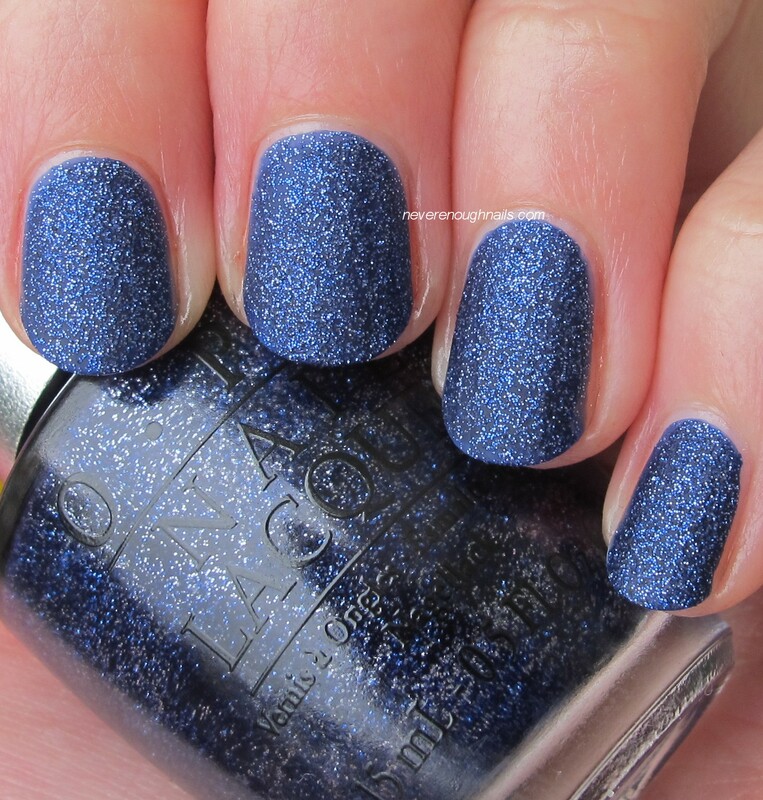 It's such a rich shade of sparkling blue, like a million stars in the night sky! DS Lapis is very smooth to the touch, unlike the OPI Liquid Sands. If you like the texture look, but hate the feeling, try this on for size. Lapis was basically a one-coater, but I did two for these pictures, mostly out of habit. Excellent pigmentation and super easy to control formula. Here's Lapis with one coat of Poshe. I love it this way too! The second new DS polish is OPI DS Pewter, a matte black/deep grey base with a couple different sizes of silver glitter. Although this looks very chunky, it too was smoother than other texture polishes, with the same frosted glass finish as Lapis. It felt a little more textured than Lapis, but still fairly smooth feeling. This reminds me a matte, slightly less black-based, OPI Metallic 4 Life, but with a way better formula. I used two coats of Pewter for these pictures. It was a little more sheer after one coat than Lapis, but still totally opaque in two coats. It was easy to apply, especially considering how much glitter is in this polish. I can see myself wearing this a lot in the winter, it's such a great polish for those times when you're in a huge rush. Here's Pewter with one coat of Poshe. This is insanely pretty! The glitters all really pop with top coat. Overall, I really love both of these polishes. They are a nice twist on the texture trend that I am currently enjoying so much. 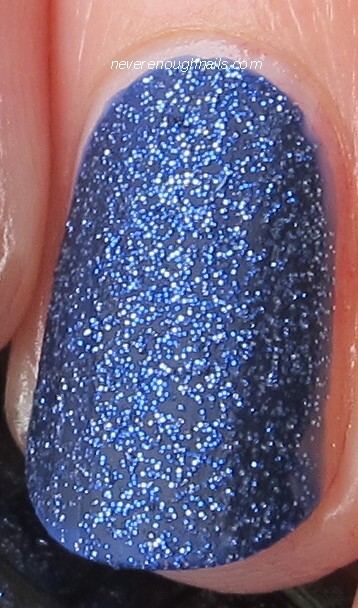 I do wish OPI would do some more holo DS polishes someday, but I am still glad to have Pewter and Lapis! OPI DS Pewter and DS Lapis will be available beginning September 2013 at professional salons, including Beauty Brands, Beauty First, Chatters, Dillard’s, jcp Salons, Pure Beauty, Regis, Trade Secret, ULTA andulta.com for $12.50 ($14.95 CAN) suggested retail for each nail lacquer.